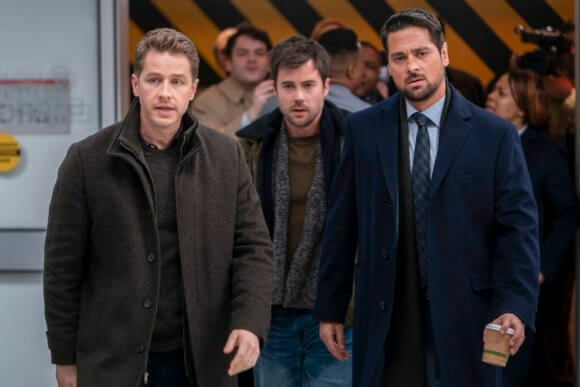 'Manifest' Season 1 Episode 15 Recap: "Hard Landing"
“I can’t help but think that we’re on the verge of discovering something awful,” says Dr. Saanvi Bahl (Parveen Kaur) to Ben Stone (Josh Dallas) as a dangerous stranger enters the mix of people who receive callings but weren’t on Flight 828 in season one episode 15 of NBC’s Manifest. Season one episode 15 begins with a flashback to the heist of a bank’s cash as it’s being loaded into an armored vehicle. Three masked men neutralize the guards using tasers and put the money in nearby van. One of the robbers shoots the other two dead and drives off. Flash-forward to present day and the robber, who should be dead, is pulled from the van after it plunged into the river. He’s been trapped inside for days but somehow emerges in decent shape. Michaela (Melissa Roxburgh) calls Ben about the man surviving and says she wants his help, asking her brother to meet her at the hospital. Ben explains to Grace (Athena Karkanis) and Zeke (Matt Long) that he needs to back up Michaela and Zeke wants to come along, too. Jared (J.R. Ramirez) shows up at the hospital wanting Michaela to fill him in. He helps get Ben and Zeke into the hospital, pass the reporters and security guards. While that’s going on, Dr. Bahl calculates how long the robber, who has been identified as James Griffin (Marc Menchaca), was under water. It was exactly 828 minutes. While the ER nurses and doctors are treating Griffin, he receives a calling. He screams out details of what he hears, saying there are flames everywhere and people are dying including children. A little later, Michaela tells Ben and Zeke about the Griffin’s calling. She believes she’s supposed to help Griffin understand what he sees and determine where the explosion is going to take place. Jared meets Zeke for the first time and immediately doesn’t trust him. His opinion is confirmed when he learns Zeke was in the cabin with Michaela and somehow they’re connected. Michaela warns Jared to stop with the jealousy. Ben checks in with Grace by phone and tells her about Griffin and his vision. Griffin’s transferred to the police station and as he’s being transferred from the hospital, he confesses to Michaela that he thought he was crazy. He knows where a bomb is going to go off and that knowledge is his get out of jail card. At the precinct, the FBI and Michaela’s boss are looking into getting Griffin a deal. There has actually been chatter of a terrorist attack, so they believe he has valuable information. Michaela asks her boss to let her talk to Griffin while they work on the deal. She thinks she might be able to get him to give up the bomb’s location. Jared backs her up, telling the captain to trust Michaela’s gut on this. Michaela calls Ben and tells him she screwed up and now Griffin is trying to get immunity for what he knows about the bomb. She asks him to research Griffin and text her the information while she interrogates him. Of course, Ben agrees. Ben fills Grace in on what’s going on and she suggests they all help. Ben’s hesitant to get Olive (Luna Blaise) involved, but Grace points out who better to help them search the internet than a teenager. So, the investigation of James Griffin is now a Stone family project. 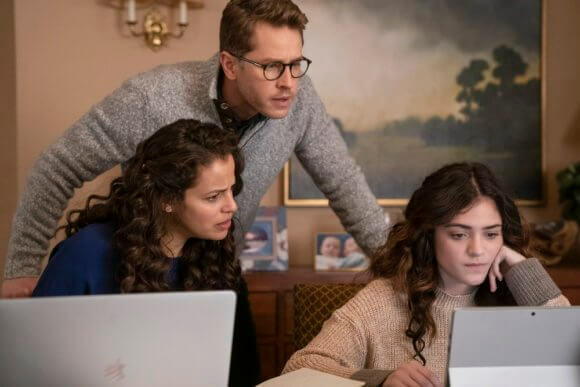 While doing research Grace comes across Cody’s website informing his followers a criminal is now part of the passengers of 828 and they must rise up against them. Ben discovers Griffin was a foster kid since age five. Michaela brings up his childhood and being a foster kid but it doesn’t faze Griffin. She asks about not having parents or a family and he tells her there are all kinds of families. His is just as strong as what she has. Olive discovers online that Griffin had a brother named Devon Carrick and that he died in 2004. Ben texts the information to Michaela, hopefully providing her with more ammunition. Ben finds an Angela Graham who runs a food bank and at one point was a foster mother to Griffin. He’s ready to take off and talk to her but Grace alters his plans, suggesting she should go. Angela might open up to her easier, mother to mother. Michaela brings up Devon to Griffin and it bothers him. He asks how she got the name. Meanwhile, Zeke has gone for a stroll and stops outside a house. He begins to look for the key to the front door. Two cops notice him and take him in as he’s trying to pick the lock. Sannvi’s collecting herself as she continues to struggle with being taken a hostage just a day ago when a colleague enters her office saying he noticed she doesn’t seem herself. He wonders if she needs to talk, but she assures him she’s fine and thanks him for his concern. Back at the precinct, Jared wants to book Zeke for attempted burglary but Michaela intervenes. Jared asks if she’s just going to trust everyone who has callings, like Griffin and Zeke, and Mic responds angrily. She assures him Zeke is nothing like Griffin. Jared doesn’t trust Zeke but Michaela asks him to just leave Zeke in a cell until she can talk to him. She doesn’t want him booked. Michaela returns to the interrogation room with Griffin and reveals she knows about Devon. He’s uncomfortable with her bringing Devon up, and Michaela shows him the file that indicates he went to jail for killing a man during a robbery. Michaela calls Griffin out, aware Griffin took a deal and lied that Devon shot the man. Griffin doesn’t want to talk about it and is rescued when Michaela is interrupted by her boss. Michaela steps outside the room and the captain informs her the higher-ups are going to give Griffin his deal: no jail time in exchange for the location of the bomb. The captain warns Michaela if she’s going to break him, she has to do it soon. They’re almost out of time. Grace finds Angela Graham who explains Devon was like a brother to Griffin. Griffin was the one person Devon ever trusted. They ended up in juvenile detention and she never saw them again. Graham confesses to Grace that Griffin was always bad. She doesn’t believe he deserves a second chance. Ben visits Saanvi who’s noticeably unnerved from the kidnapping. She admits in her mind she knows what’s wrong with her but she can’t stop herself from going through it. Ben explains she’s having PTSD and to give herself a break; it’s only been a day since her traumatic event. He sits close to her and reminds her she’s not alone, assuring her he and Michaela are there for her. Saanvi confesses she’s afraid everything they’ve been working together to discover about the calling and what happened to them on Flight 828 could be awful. She also tells him she tested Griffin’s blood to see if he has the same marker as the rest of the people on Flight 828 and Zeke. He does. Back in the interrogation room, Michaela shows Griffin a photo of Devon and asks him to do the right thing to help her save lives. Michaela’s boss enters with the FBI agent and tells her the higher-ups have arrived to give Griffin his deal. “Nice chatting with you, detective,” says Griffin as Michaela steps out. Michaela talks to Zeke in his cell, offering him a cup of coffee. He confesses he went to see how his mother was doing. She wonders why he didn’t just knock and he explains he’s given her too much heartache already. Michaela cuts Zeke loose and sends him off to see his mom the right way this time. Jared becomes upset Michaela let Zeke go, but she suggests he drop it. After Michaela walks away, Jared fetches Zeke’s coffee cup out of the trash can and sends it off to be tested for prints and DNA. Ben returns home and asks Grace if it’s possible what they’re doing is all wrong. He really, justifiably, wants to know what they are a part of. Grace suggests it’s about how a person chooses to use the calling. Griffin gets his deal. On his way out, Michaela warns him the callings are not to be abused. Griffin reveals he’s taking them to a whole new level. Later in Times Square, the bomb squad are able to locate the bomb in a hot dog stand. They deactivate it as Michaela and Jared watch from a distance. They should be safe, however Michaela hears snarling and turns to see the same wolf that Zeke and Cal (Jack Messina) saw in their vision. The wolf runs off and Jared, noticing Michaela’s reaction, assures her the bomb has been deactivated and they’re good. “No, we’re not,” replies Michaela.